Preheat the oven to 180℃ (160℃ fan)/350°F/gas mark 4. Grease and line a 25 x20 cm (10x8in) shallow baking tin or roasting tin with baking parchment. Make the brownie mixture by beating together all the ingredients with an electric whisk to produce a smooth batter. Pour into the prepared tin and level the top. Beat together all the ingredients for the cheesecake mixture until combined, Pour over the brownie mixture in the tin. 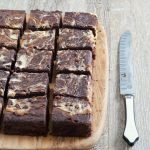 Using the blade of a dinner knife, swirl the cream cheese mixture into the brownie mixture to give a marbled effect. Bake for 35 minutes or until the brownie is springy to the touch. Cool and serve cut into squares. The cheesecake brownies will keep for up to 5 days if stored in an airtight tin in cool place.